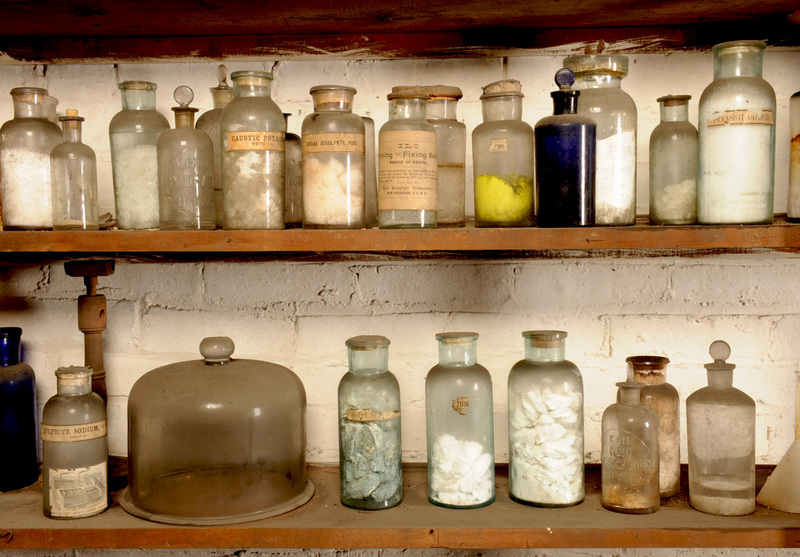 The basement of the mansion is vast and was designed with areas to serve different storage purposes, including three different types of coal, wood, a milk room, and a wine cellar. 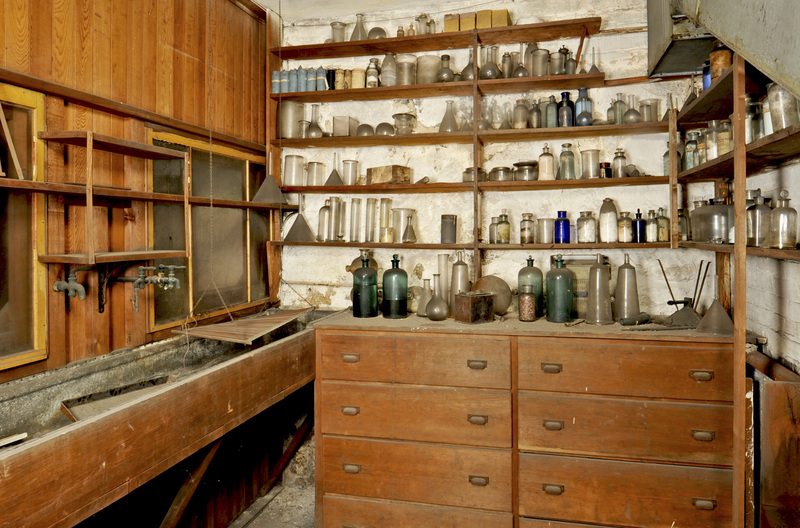 It also housed much of the equipment to power the modern systems running the house. 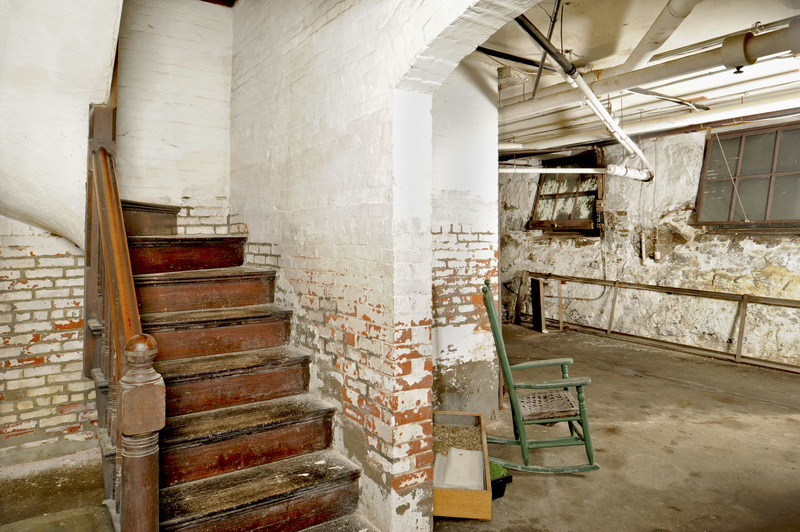 The basement is not open to the public but these photographs give you some idea of the space. 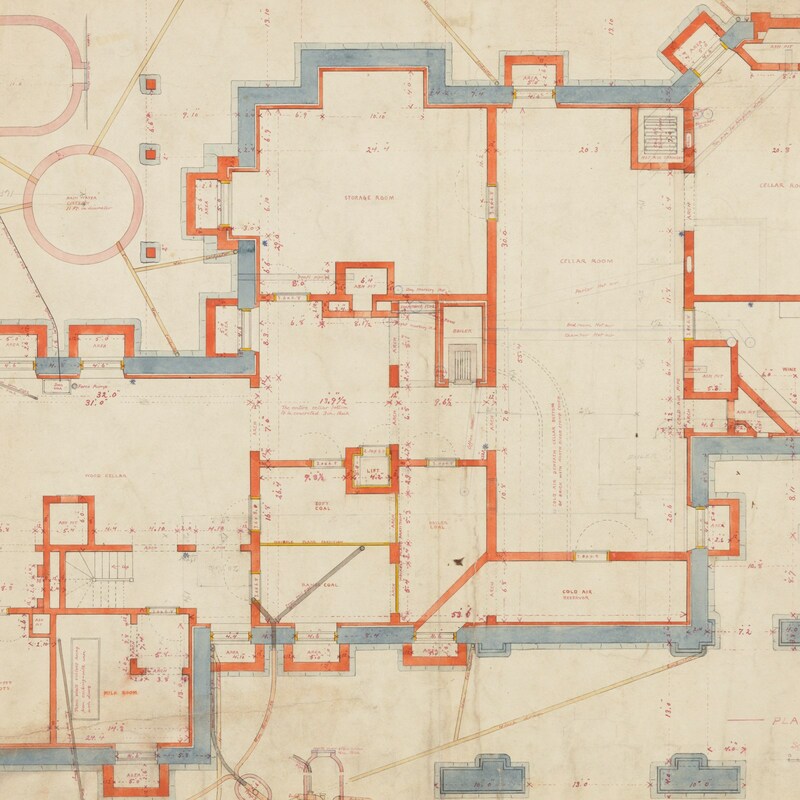 The builder’s plans lay out the various storage areas of the basement, the heating systems, and the cisterns that collected rain water from the roof for use in the house. 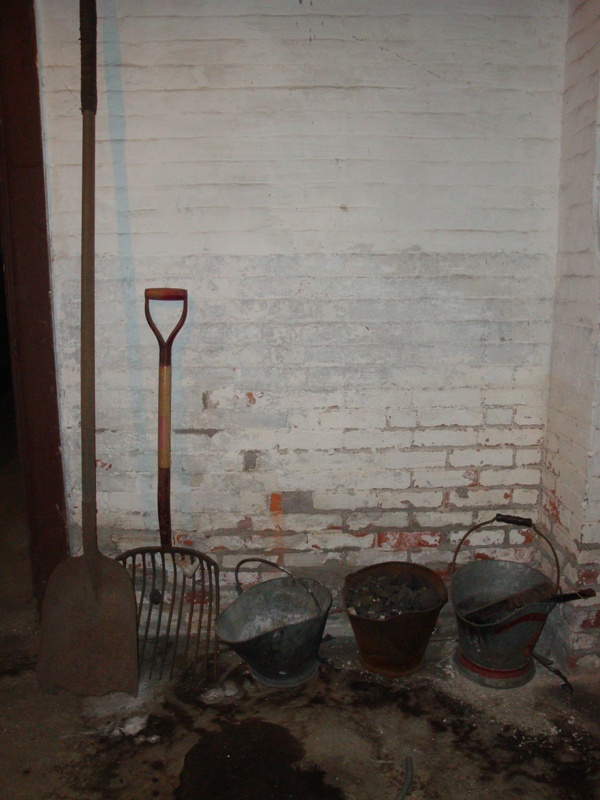 The Eustis Estate was heated by both wood and coal and the basement had storage areas for both. The plans for the house show different rooms for range coal, soft coal, and boiler coal. At some point in the history of the house, there was an electric sawmill to cut wood to proper size, which was then distributed through the house using the elevator. 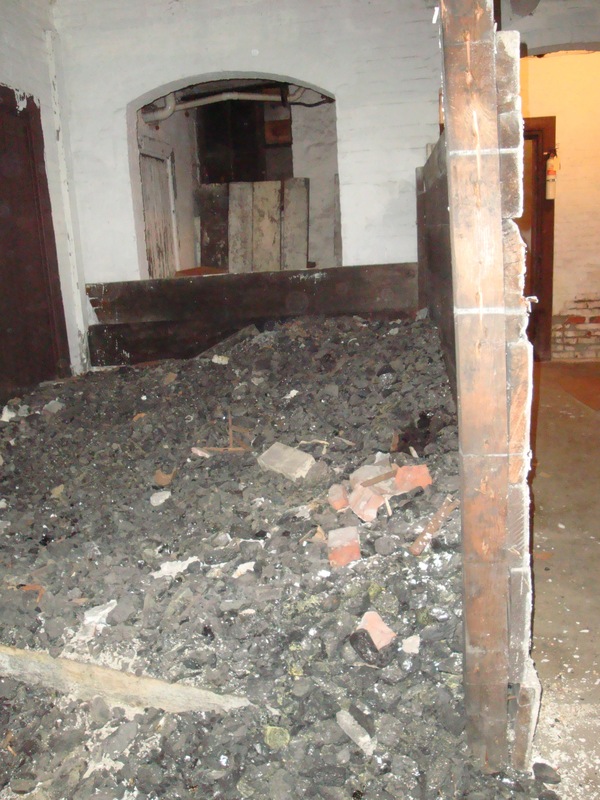 When the house was purchased from the Eustis family, there was still a coal bunker left in the basement. As a mining engineer, W.E.C. 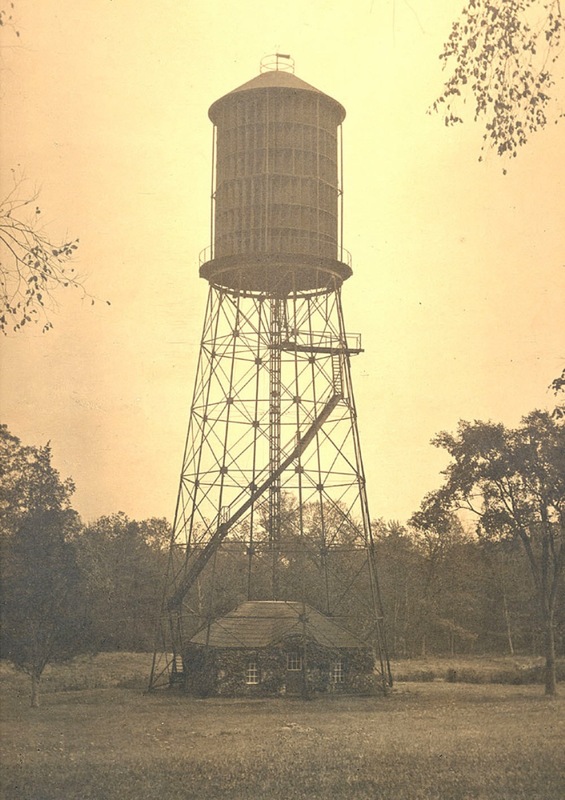 Eustis was an early adopter of new technology, including electricity, and the construction of the cottage-like power house showed his commitment to the new source of energy before it was available to the residents of upper Canton Avenue. The building originally housed an electrical generator that was powered by a massive wind turbine 90 to 100 feet above it. The power generated here would charge batteries in the basement of the house that were used to power the lights and appliances. He would check [the windmill] twice a day to change instrument charts and to see that everything was working fine. The wind would usually handle the generating of electricity and the pumping of water, but in calm weather, Dad would start the huge gas engine to supplement the wind…The engine could be heard half a mile away. The mill would pump water and charge the batteries in the basement of the big house. At one time, it supplied the electricity needed for all purposes. W.E.C. Eustis was an avid photographer and sometime after the original construction of the house, a dark room was added to a storage area of the basement. He could develop prints from his glass plate negatives right in his own home. Most of the beautiful historic photographs throughout the house were taken by W.E.C. in the 1890s.